For bushwalking starters or beginners. How to get started on walks in Perth region, Western Australia. If you are new to bushwalking, join one of the local bushwalking clubs and learn the basics first-hand from experienced club members. Also try out a few of the shorter on-track walks provided on this site or published on Trails WA and elsewhere that don’t require GPS or compass navigation skills and are located close to Perth. WalkGPS includes shorter walk options for many of the walks which could be suitable for warm weather. Shorter walks and near-city walks along the Swan and Canning River foreshores or in Bold Park, Kings Park, or Whiteman Park are also great alternatives for early morning exercise in the summer months when the days are otherwise too hot for the longer distances. Also see WalkGPS blog post for 10 good shorter walk suggestions. If you have a young family, visit the unashamedly ‘ocker’, but delightful Sandgropers family site to see how early and easily the kids can be introduced to bushwalking, to develop a love of nature, the outdoors, and a joy of life in general! Also see the WA Family Bushwalking Club for walking opportunities for all the family. The information on WalkGPS will help you easily find your way to walk start points and discover the walk routes. See Transport and also Access /Directions on each walk page. 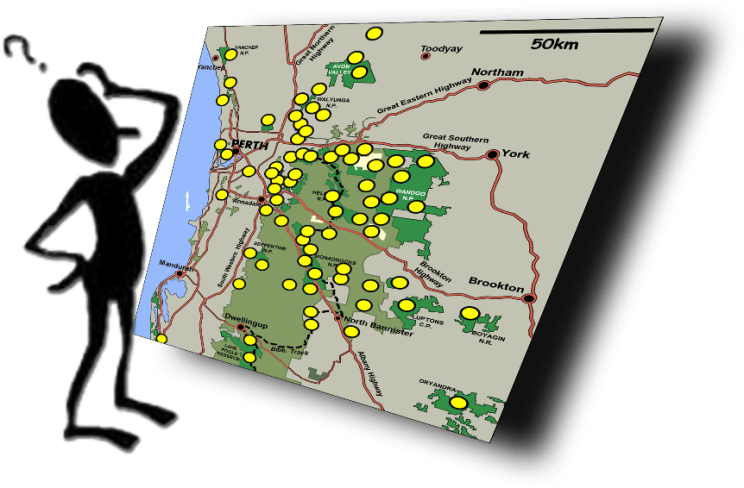 See WalkGPS Walks & Parks page for links to information on several established walk trails within the Perth region that are not described on WalkGPS e.g. Coastal Plain Walk Trail, Kyotmunga Walk Trail, Yaberoo Budjara Walk Trail, Kattamordo Heritage Trail, Numbat Trail (Paruna Sanctuary) and Bibbulmun Track (and Munda Biddi Bike Trail which is also accessible to walkers). If you haven’t used GPS before, you should first develop and test your skills close to home before heading off-track on these walks. Becoming proficient at using a GPS unit should be no more difficult than learning to use a mobile phone. Combined with a few basic map reading skills, your GPS navigation skills will soon allow you to confidently and accurately navigate off-track through the bush and to fully enjoy the bushwalking experience and environment, freed from the usual limitations and uncertainties of traditional compass navigation. For your own safety and the re-assurance of others in the case of emergency, especially if you walk alone, consider investing also in a handheld GPS personal locator device, either a Satellite Personal Tracker and Messenger or a Personal Locator Beacon (PLB) with built-in GPS. Also read WalkGPS Access & Issues pages and Disclaimer. If you are uncertain if walking of any kind is the right activity for you, see WalkGPS Why (not) Walk? page for some inspiration through poetry and prose.